*Situated down a private driveway, a few steps to the edge of Lake Rotorua, with expansive views of the lake, this welcoming property will charm you from the moment you walk in. 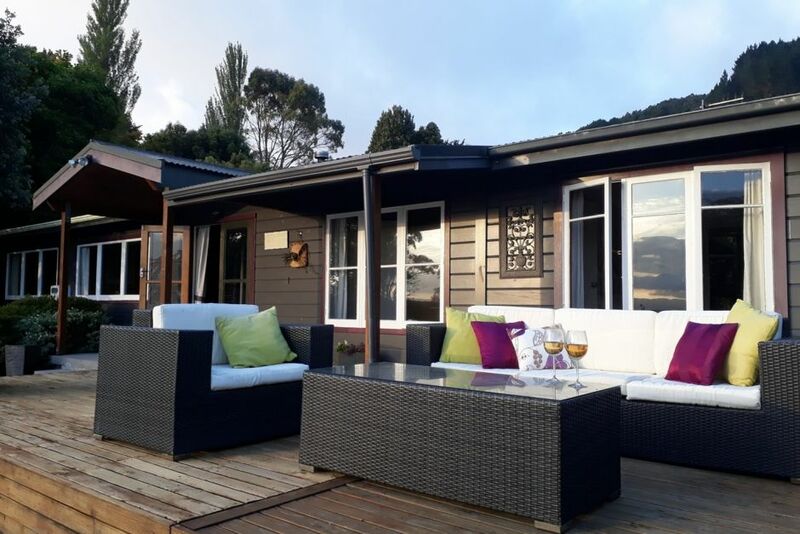 *The warm Lockwood home has lots of space and is perfect for those wanting a quiet, relaxing, place to stay just outside of Rotorua city. *Stylish comfort is the essence of this home which has a sheltered deck at the back of the house surrounded by gardens. *Outside dining while listening to native birdsong is a real treat. *Sitting on the front deck you have a wonderful view to the city over the ever changing moods of the lake. * 2 mins from Hamurana Golf Club and Hamurana Springs, boat ramps and local store. * 7 mins from Okere Falls Store/Cafe craft beers, delicious food and occasional entertainment. * 10 mins from Ngongotaha Village with cafes, Post Shop, grocery and butcher shops, pharmacy, hairdresser, bottle store, takeaway foods, petrol station, etc. * 15 mins from the Gondola,/Restaurant/Luge, Fairy Springs, Kiwi House, Agrodome, Zorb, Off Road 4x4 and Mitai Maori Concert and Hangi. * 20 mins to Rotorua City, with tourist attractions such as Whakarewarewa Thermal Wonderland, Polynesian Spa, Museum of Art and History, Government Gardens, Redwood Forest and Mountain Bike Trails, Tamaki Maori Village, Blue and Green Lakes, Mt Tarawera, Buried Village, Waimangu Volcanic Valley, Hells Gate Geothermal Park and many more. Everything met our expectations. Extremely spacious. Very comfortable and clean. Wish we could have stayed longer. Everything you could wish for and with a stunning view . This is a home not a rental ,beautifully presented, well equipped, set in a lovely garden with decks back and front to relax on we thoroughly enjoyed our stay and will definitely be back next year. Thanks for your comments Phillipa. I look forward to seeing you and Ashley again next year. This is a beautiful little house tucked away down a quiet driveway, looking out onto the lake. The house is clearly loved by its owners, well-equipped, beautifully furnished and full of personal touches. It felt like we were staying in someone's home, not just their bach. The little extras like home-baked cookies, croissants left for our first morning, and fresh flowers in rooms, all added to the welcome. While the views from the deck are simply majestic - at all times of the day and in all weathers - the well-kept garden is worth exploring too. Quite stunning all round. We loved our stay here and really hope to visit again. The view over the lake is fantastic. The kitchen is well prepared to cook what you like. You have much space to relax. Great place to relax and enjoy the views from the lake. Beautiful and quaint home with everything you will need on holidays. Wife loved the gardens. This is a very couple orientated retreat right on the lake - and we really enjoyed our 2 day stopover in Rotorua. It is just far away enough to watch the city lights by the fire over the lake - yet close enough to go out for dinner if you wish. Really lovely all round - thanks again Geraldine.